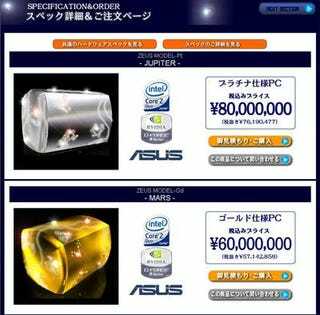 In the proud tradition of putting diamonds or gold on otherwise-uninspiring devices and giving them a ridiculous price tag to get publicity, Japanese company PC Zeus is offering a couple of rich-idiot aimed computers. The first is a PC with a diamond-encrusted platinum case. It sells for $750,400. Too much? Well, there's also a gold case PC available for a much more reasonable $562,800. What about the specs? Do you really care? Whatever, here they are.